Solomon Carvalho painted the interior of Kahal Kadosh Beth Elohim from memory after the synagogue was destroyed by fire in 1838. He offered the canvas to the congregation “for such Compensation as the Board may deem proper to allow.” They judged it to be “neat & accurate” and paid him $50. Charleston’s Jewish community had begun meeting formally in 1749. Like congregations in London and Amsterdam, K. K. Beth Elohim, or Holy Congregation of the House of God, followed the Sephardic minhag (liturgy) of the Spanish-Portuguese Jews. 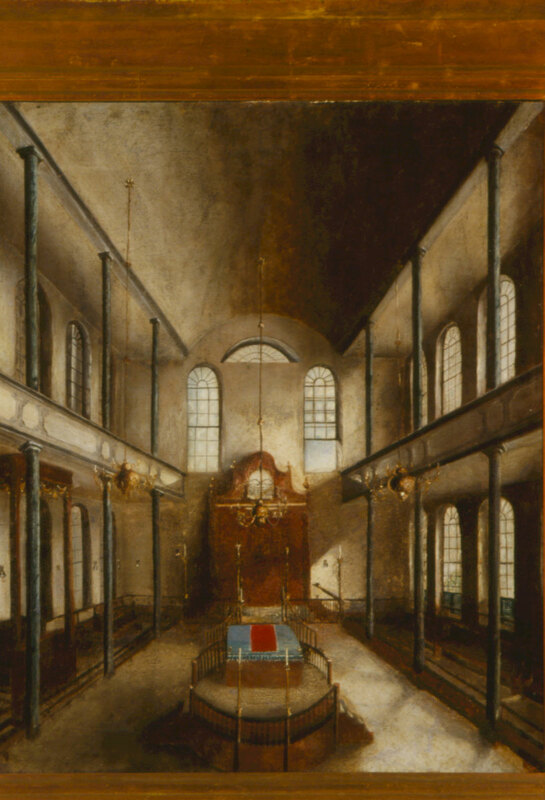 By 1764 Beth Elohim had occupied three different meeting houses, each more substantial than the next. Evidence of early tensions between “Portuguese” and “German” Jews points more to cultural differences than to disputes over doctrine. For a time the two groups maintained separate burial grounds and may have worshipped separately. In 1790, the Jews of Charleston put aside their differences and united to support the new state constitution with its guarantees of religious freedom. 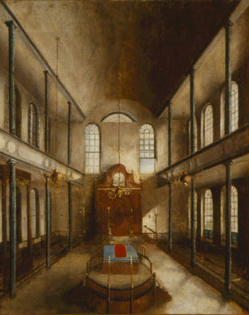 The following year Beth Elohim petitioned for incorporation and, in 1794, completed construction of its first synagogue, the sanctuary depicted here.